At only 24 years old Daniel Martin has become one of the go to guitarist’s in the UK. He’s played lead guitar with some of the biggest artists of the 1960’s. From 2010 to 2015 he played lead guitar with 60’s icon Dave Berry. 2012 saw him play lead guitar for the legendary Bruce Welch and his Shadows as well as ‘Are you Being Served’ actor Mike Berry who had numerous hits in the 60’s as well as making the top 10 with Sunshine Of your Smile in 1980. In 2014 he toured with Country Star Jerry Kilgore and Nashville artist Kinsey Rose. 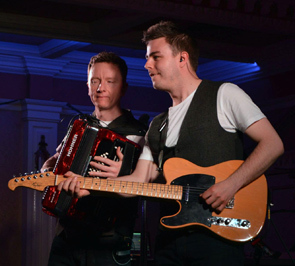 Daniel relocated to Ireland in 2015 to play lead guitar for Irish country star Lisa McHugh you can also see him playing rhythm guitar with Irelands biggest star Nathan Carter and his new DVD which will be out in late 2015.